In the middle of a losing season? Losing is extremely disappointing, but as many of this year's NBA rookies are finding out, it can also become contagious. 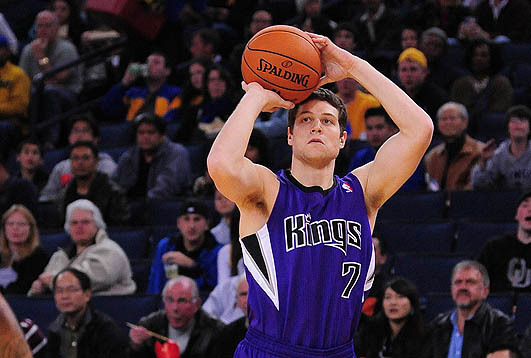 Last week, Jimmer Fredette, the Sacramento Kings' 2011 first-round draft pick, spoke about the challenges of staying mentally tough through a difficult season (the Kings are currently 11-22). "You've just got to instill a winning attitude within the team. Everybody's got to have it," Fredette said. "You can't have a losing mentality even though you're on a losing team. That's something I think that guys can fall into... That's something I try not to get used to. You always stay mad. You always stay ready to go so you can try to keep winning basketball games." Instead of trying to change his team through words, Fredette is leading by example. After practice, he spends extra time on the court and in the weight room, even though his team is nowhere near the playoff hunt. Sport psychologists would say that Fredette is improving attitude through behavior, an important step in building mental toughness. Teams going through losing streaks often struggle against complacency. As the losses pile up, each player must choose whether he or she will keep working to improve or just start looking toward next season. Ever been through a miserable season? What did you learn from the experience? Let us know on Facebook and Twitter, and check out 10 Tips to Pick Yourself Up After a Defeat. Mental Toughness: Attitude or Behavior?